Hello there lovely people who are taking time out of your day to read this post… welcome back or if you’re new, welcome! I never really like the idea of ‘New Year Resolutions’ because I’m one of those that believe you can make a decision to change in any second and don’t have to wait for a Monday or New Year however saying that there are a few ‘BIG SCARY DREAMS’ and equally as important smaller goals I’d like to get started on or complete in the next 12 months because look, I’m still going to hop on the hype anyway. So, with that been said, my dream is to have written a book by the time I’m 30. If I want that to come true then I need to start actually writing said book so this year I’m committing to writing something every day, even if it gets cut. 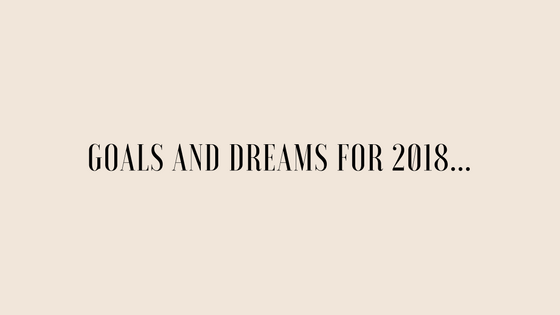 Another one of my ‘big scary dreams’ is to one day be able to be a freelance writer so I’m able to travel, which won’t happen if I abandon my blog anymore, so again, this year I’m committing to my blog. I know what niche I want to go into and finally feel at peace with my content. For the first time in a while I’m EXCITED about blogging and being more involved in the community. Anyone who knows me, knows how indecisive I am. To the point I always have multiple choices in restaurants and tend to panic order when a waiter comes over. I CONSTANTLY think I should be doing something I’m not or that I’ve made a ‘bad choice’ or that my life doesn’t look like (insert name of pretty much anyone I know here) life does. This year I want to just cultivate my own little corner of the planet and see what happens from there. Another, little goal I have is to go someplace or try something new every month, even if it’s just a trip to York or Liverpool or going to a spin class :’) This year is going to be ADVENTUROUS! And of course a goal I have every year but seem not be able to be consistent with, is to read 12 books in the year. This year though, I’d like to mix it up a bit and read all sorts from different types of authors and themes to non-fiction. I’ve already got a couple that I can’t wait to get into and a whole list to get through. It seems I’m all out of tea now so even though this has been brief, I can’t wait to dive right into blogging 2018, something tells me this year is going to be extraordinary. Let me know what some of your dreams are for the next 12 months, or beyond!! I hope you’ve had a lovely Christmas and New Year and have huge amounts of hope in your hearts, even if right now it’s just an ember! Thank you for taking the time out to read this!! I really appreciate it!